if (tilehit & 0x40) // don't scroll the door sides. Now, to make a wall scroll, just place the appropriate object code above the wall tile. You find these codes in the switch statement. ie: object code 8 will make the wall scroll from left to right at a fast pace. You slow down the scroll speed by increasing the divisor value. You change the scroll direction by changing the + to a - (as seen in 10 and 11). You can also try vertical scrolling, but it won't look as good. The problem here is that parts of the adjoined textures in memory can sometimes be seen as it scrolls and the texture will sort of click over once it reaches the bottom. If you try it, you'll see what I mean. I do not think that this will cause a drop in the FPS. If you use wall decals, I think that the decal will scroll along with the texture. Sooooooo simple!?!?!?!? It looks like the wall patches tutorial! Have fun, but both methods use an object to modify the wall. What is this really? Scrolling Wall Textures? 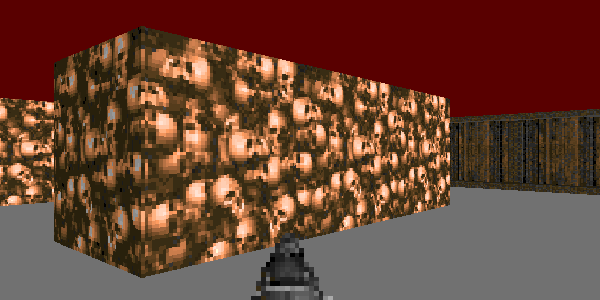 You mean like those "Flesh Walls" in Doom going <------< like that? Yes, that's what I mean. A screenshot just wouldn't have worked for this..
That's the reason why vertical scrolling looks bad, but the horizontal scrolling seemed OK with the original code. I had 3 in a row, and 1 more diagonally and they scrolled smoothly. I'll check again, but I'm pretty sure it was only scrolling one texture (not half and half). The reason I just incorperated it into the Darkone Raycastor code is because it uses 1 single routine in replacement of the HitVertWall and HitHorzonWall routines in the orginal code. OK, let me try to explain this... it's actually a twisted optical illusion, if you ask me. As it is scrolling horizontally, we guarantee the post to be drawn always starts at the top pixel (a multiple of 64) using "&0xfc0". Now, with vertical scrolling, we don't do this nice alignment. we say the top pixel goes from 0 to 63. When the tpo pixel is 63, the bottom right pixel is 4095 + 63, out of range (in the next texture). Think of the texture as a line of pixels being cut up into posts. When the top pixel of one post goes up 1, it becomes the bottom of the next post to the left, or runs off the edge. The only way to do smooth vertical scrolling would be to alter the texture (ala some code similar to wall patches) so that we rearrange the pixels post-by-post. Which, come to think of it, wouldn't be too hard. It would be interesting for you to make Pulsating lights like in hexen using this method, but it may not look right without pulsating lights on floors. Be great for a scifi mod. 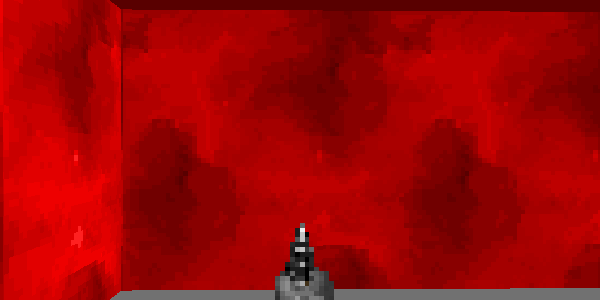 How do I add the scrolling walls to my game? Do I add them in FloEdit with the codes you said? Wolfen-Terror almost finished. Visit http://projectwargentine.110mb.com/Wolfen-Terror.html for more info. I don't know how to do this in Floedit but you need to add objects with ids from 8 to 11. You have to put these objects over the walls you want to scroll. With Adam`s code objects 8 and 9 make the wall scroll from left to right and 10-11 make the wall scroll from right to left. Thanks for the fast reply! I got it to work with Floedit. Now I stumbled upon another problem, does anybody know how to get this to work with 128x128 graphics? I changed the 64's to 128's too. Would this code need some adjustments to work with Wolf4SDL? I copied the code to my project and it's having no effect whatsoever. I'm now thinking that Wolf4SDL could really use some sort of debug console/log. Something you could call from anywhere and write comments and variable values into. So you could tell which part of the code is not working. Though now there's a one pixel/less than one pixel seam on the far left side of every row of scrolling textures. Are you using that tutorial by Chris that connects walls that are apart by the corners? This is probably what you're seeing. I don't recall any such tutorial, and the seam also appears between two sides of the same wall, so I guess that's not it. If that's the case, then it probably is Chris's tutorial. Many updates of Wolf4SDL have this tutorial already put in. Not sure if that version affects scrolling walls but I should put it in a define regardless so you can easily turn it off and on. @Military: Just to confirm, you checked the code I posted, and yours was similar to one without the green... or? I checked it now, and my version doesn't include the added code from there.